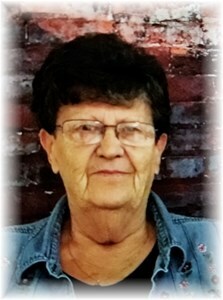 Judy Rackley, 72, of Indianapolis passed away November 12, 2018. An Indianapolis native Judy was born on July 18, 1946 to Granville & Gladys Schaedel. Judy loved her grandchildren and great-grandchildren, enjoyed playing cards and spending time with her friends. You could find her in the garden planting flower or off going fishing. Judy is survived by her husband of 56 years: Al Rackley; children and their spouses: Kenny & Demita Rackley; Buffy & Darren Hartland; grandchildren: Ashley (Kyle), Kenny Jr. (Jordan), Kody; great-grandchildren: Makinzie, Konnor, Paisley and a host of other family and friends. Judy was preceded in death by her parents, grandson: Dustin; 2 sisters, 4 brothers. Visitation will be on Saturday November 17, 2018 from 1 P.M. until her Funeral Service at 3 P.M. at Newcomer - Indianapolis Chapel, 925 E. Hanna Ave., IN 46227. Add your memories to the guest book of Judy Rackley. I'm sorry to hear of Judy's passing. I remember spending many a Tuesday night at the bowling alley with her and Al. Judy, I Have Only Known You A Few Months Through Playing Cards. But You Were Always So Nice And Friendly. And A Joy To Be Around And Play Cards With. You Will Be Missed Terribly And Cards Will Never Be Th Same. I Hope They Play Texas Hold'em In Heaven For You. Al And Family My Thoughts And Prayers Are With You, And I Know Judy Will Be Watching Over You! I am not sure how to put into words how much I thought of Judy and rest of the Rackley family. I moved to Indianapolis about 14 years ago. I didnt know anyone in the area and Al and Judy instantly became family. They treated my family like I was a part of theirs. Although I left Indianapolis many years ago and havent gotten to see them as much, the admiration and gratitude I have for them has never changed. Thank you for all the great memories. To the family of Judy Rackley.... saddened for your loss.... may you be comforted by the love of family and friends and by the many happy memories you have of her. I will be praying for you all during this hard time. Although I only had the pleasure of knowing you for the last 6 or 7 months, I am truly honored to have had someone like you in my life. The laughs we shared, the conversations we had, and our friendship, will always be with me in my mind and heart. Your smile, your kindness, and your hugs, will be deeply missed. My tears are from losing you, my smiles are from memories of you, and both of these will last forever. Until we meet again, I love you Judy. Even though I’ve only know you for less than a year, you truly became a great friend. I thank God for the times we spent playing cards, talking and laughing together. You were always a blessing with your generous and kind heart. I love you Judy and you will be truly missed. My prayers go out to Al and your entire family. Rest in heaven my sweet friend. You will be so missed, I didn't know you a long time, but you were so easy to love and quick to be a great friend. My heart breaks for your family, children, grandchildren, Al and your bestie, Geraldine. I feel my life was blessed to know and interact with you for the time I did. I will forever cherish the last Saturday we spent at dinner and playing cards. Rest in Heaven, beautiful Judy, and save me a place at the poker table. I pray I'll see you again!! God Speed Judy. Thanks for all the memories. You will be missed by all who knew you and your loving ways. I hope they have Texas Hold'em in Heaven so you can keep beating the pants off us old men!!! !